Star Bazaar Private Limited owned by Naveen Malhotra is a registered company founded in 2003 that runs a supermarket under the brand name at Kailash Colony in Delhi. In 2008, Naveen filed a petition at the Delhi High Court against Tata Trent for using the name ‘Star Bazaar’ for its hypermarket, launched in Ahmedabad in 2004. Naveen had got a stay order in November 2008 against the use of the brand name by Tata Trent. 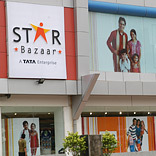 Naveen Malhotra claims, “Despite the petition, Tata Trent, is still eyeing to expand its presence in the same format across various cities, hence there arose the need to file the petition once again.” Recently the Court ordered the stay while permitted Naveen to open stores in the other cities under the brand name, Star Bazaar. The Court declared to revise the case on January 7, 2010, until then the stay order passed on Tata Trent would be active. Tata Trent spokesperson declined to comment on the issue. However, Malhotra revealed that he will open a store in Mumbai under the same brand name, shortly.